Everyone knows I have a giant sweet tooth, and baking sweet treats fills my heart with joy. I feel like celebrating every time I create a new dessert (l mean throwing a party for real). 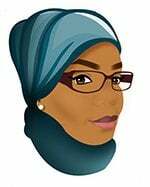 This may sound crazy to you if you are not a food blogger but in my world food blogger’s planet, it is normal to feel this way. The recipe I’m sharing today is inspired by this video, after watching it I could not help myself and decided to make an Apple Almond Cake. One: This cake is so moist. Three: The toasted almonds went great with this cake, it not only made the Apple Almond Cake look good, but also gave it a hint of nutty flavor and a light crunch. 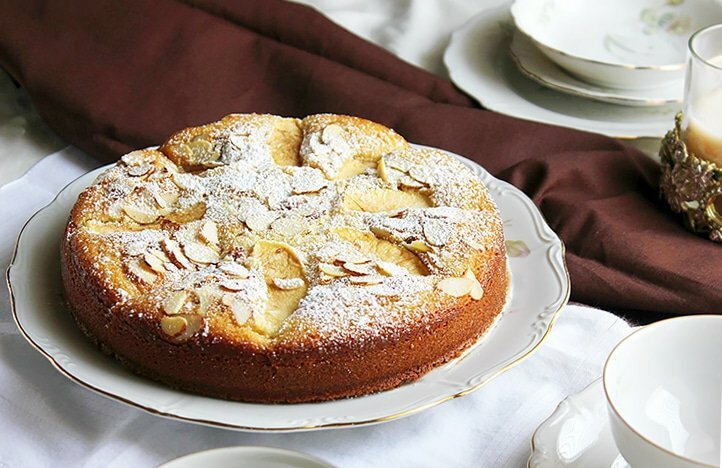 Four: This Apple Almond Cake looks elegant. 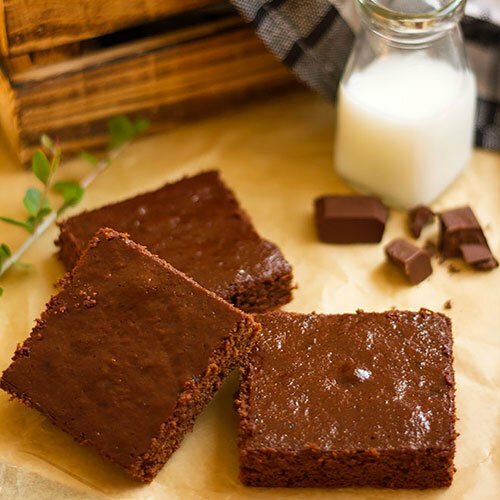 Five: It’s so delicious and although it’s rich, you will go for another slice. 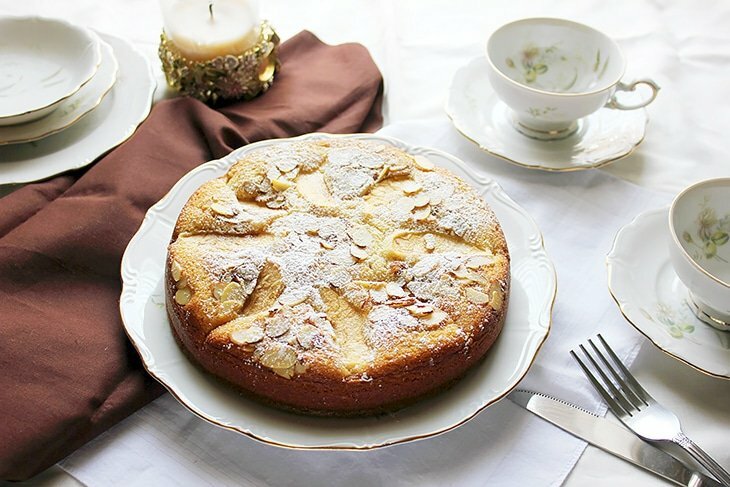 Six: Apple Almond Cake, is not as sweet as other cakes, the sweetness is perfectly balanced. Seven: It made my kitchen smell sooooo good. 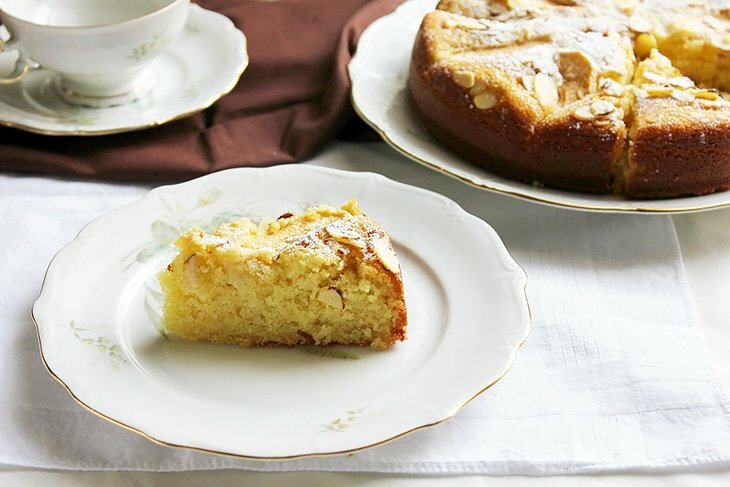 Don’t be surprised, Apple Almond Cake has a lot of butter, and we all know that butter makes everything better! Having said that it’s better to enjoy a slice and not to over indulge. I won’t mention how fast the cake disappeared in my house because that will be embarrassing! However, I can tell you that we didn’t feel guilty attacking this beauty the way we did. Oh, and let me mention that the best companion to this cake is black coffee with no sugar added. 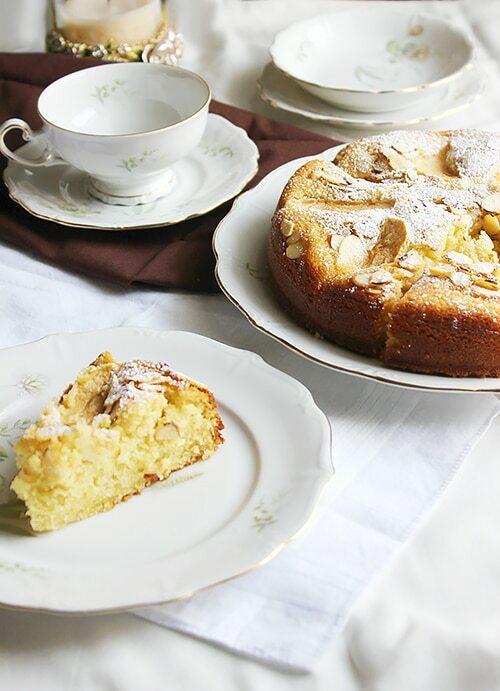 I hope I tempted you enough to make you want to make this Apple Almond Cake. I am almost certain that this cake was created to please a royal family, something is very sophisticated about it. I’ve made minor changes to the original recipe to make this cake fluffy, and moist. 1 peeled and sliced apple to place on top of the batter. 1/3 cup sliced almonds To sprinkle between the apples. Line a 9” spring form pan with parchment paper, or grease, flour the pan, and keep aside. In a bowl, add all the dry ingredients – except almonds - and whisk well. In another bowl, add all the wet ingredients and whisk well. Add the dry to wet ingredients and whisk gently until combined. Do not overdo this step or the cake will come out dry and tough. Pour the batter the baking pan, then place the apple slices gently on top. Add the almonds between each apple slice and in the middle of the cake. Bake for 40 minutes or until a toothpick comes out clean from the center of the cake. Keep the cake in the pan and cool on cooling rack for 10 minutes. Remove cake from the pan and let it cool completely on cooling rack. It looks so beautiful and I am very sure it tastes just as amazingly delicious as it looks! This looks amazing, so moist, tender and super delicious. Pinning! I bet that tastes amazing. I love yummy cakes like this. Apples and Almonds. What an amazing taste combo. Did you save me a piece? One of the things I like best about this cake is how elegant it looks. The garnished almond slices really puts it over the top. That, and the fact that you used powdered sugar instead of a frosting or glaze. This sounds like a great cake recipe! I have never tried this flavor combination, would be wonderful dessert for a weekend dinner. WOW! Apples and almonds are two of my favorite foods! I need to make this! Wow, this looks like something from a magazine! I love the idea of pairing apples and almonds together! The apple cake looks perfect! I can see that it’s so moist and the almonds are perfectly blended! I could go for a slice of this right about now for dessert. It looks fabulous and delicious. This is going to make a great dessert. It looks so delicious and easy to make. My kids are going to love it. 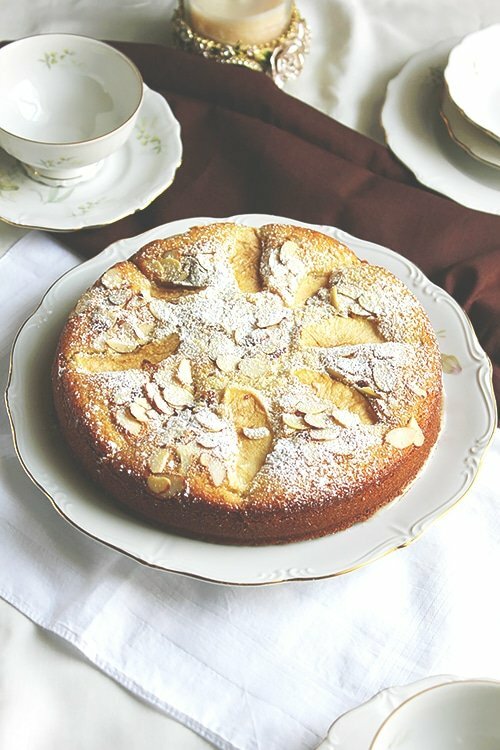 This Apple Almond cake looks extremely edible! You had me at the buttery part. Plus the taste of apples and almonds is a fantastic combo! Do you ever feel like you need excuses to use your nice china or serving pieces? I inherited my husband’s grandmother’s crystal snack trays (rectangular plates with a space for your punch…and your cigarette). 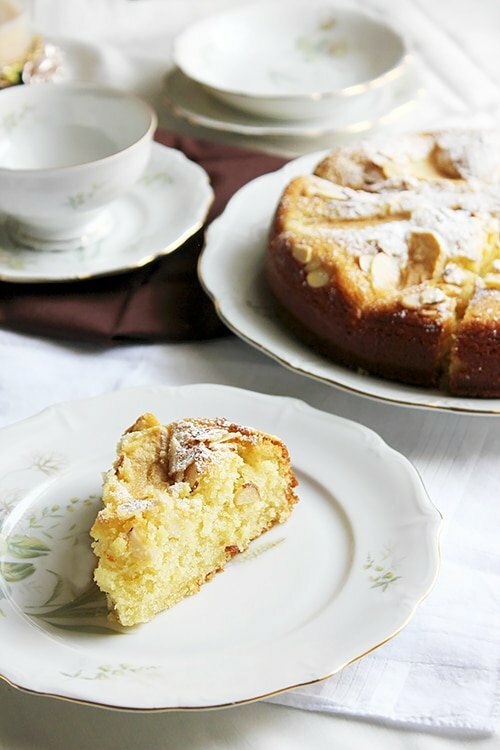 This apple almond cake would be perfectly served on them. Love the apple and almond combo! I may have to make this for our Mother’s Day Brunch! This cake seems very Euro in nature to me. And wow, it looks so moist too. My husband would like it in the morning for breakfast. Yum! I bet this taste amazing. I’m just imagining how good your house smells from making it. This cake looks so amazing. I cannot wait to make it and try a slice myself. This cake looks so good and perfect for evening coffee! !I love making desserts too but if only I could eat desserts instead of regular food too!I wish that was possible! Ami, you and I are singing the same song 🙂 … Thanks for stopping by my friend! This cake sounds delicious. Your pictures are beautifully styled. Love the dishes.